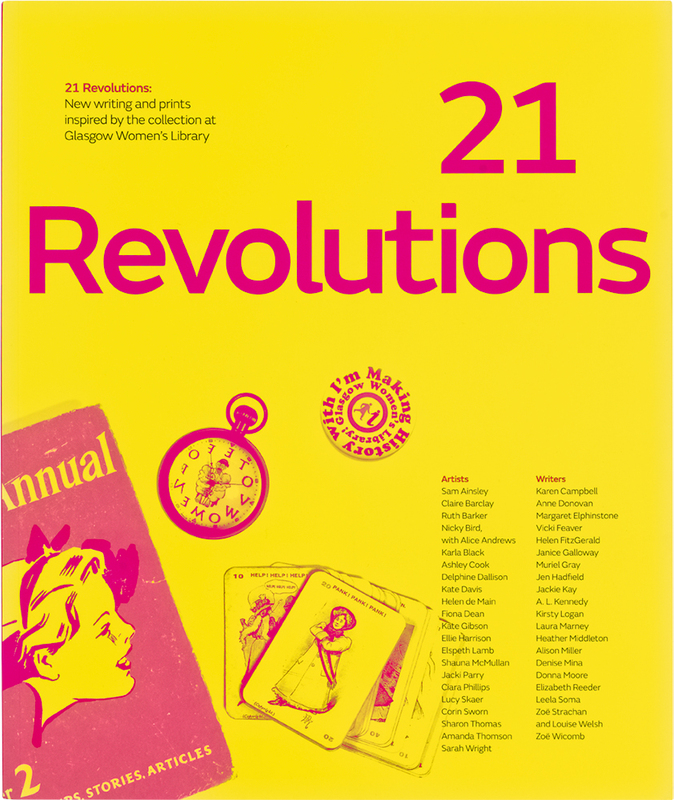 21 Revolutions tells the story of Glasgow Women’s Library (GWL) through the eyes of 42 women – 21 artists and 21 writers – who have created work that responds to the Library’s unique collection of donated materials, writes Elizabeth F. Beidler. Helen de Main’s 21 Spare Ribs, 2012, inspired by the Glasgow Women’s Library collection of the feminist magazine Spare Rib 1972-1993. Photo: Alan Dimmick. Top: cover images by Tian Khee Siong. For this book, artists and writers created new work inspired by the Library, to celebrate its 21st anniversary. They drew inspiration from well known works by Virginia Woolf, Germaine Greer and Doris Lessing as well as feminist sci-fi, hippie self-sufficiency manuals, artists’ monographs and sociological studies focusing on Scottish women’s lives. Other printed materials include knitting patterns, cookery books, instructional pamphlets, feminist posters, teen magazines and radical newsletters; artefacts consulted include a suffragette brooch and umbrella stand. 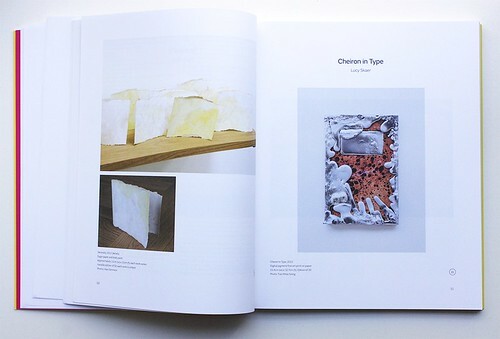 Karla Black’s Necessity, 2012 (left), a series of 50 small sugar paper sculptures and Lucy Skaer’s Cheiron in Type, 2012 (right), which uses a damaged copy of Cheiron by R. C. Trevelyan, published at Hogarth Press by Virginia and Leonard Woolf, cast into a block with melted tin type. 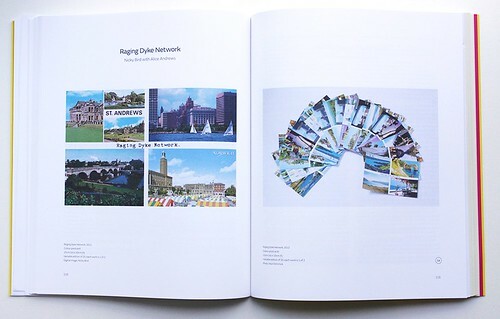 Spread showing Raging Dyke Network by Nicky Bird and Alice Andrews, 2012. 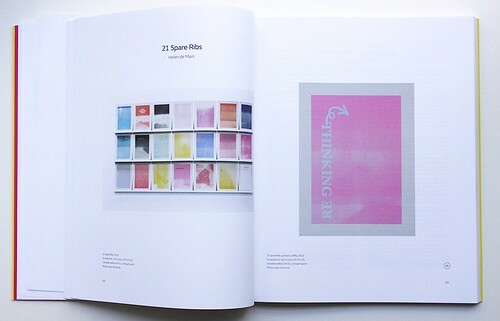 On large pages of uncoated stock sit essays, short stories, poems and images of artworks. Each contributor’s biography includes a short account of the document or artefact that inspired her. It is a stimulating way of exploring history through various viewpoints and voices, especially when more than one author / artist has responded to the same artefact – as in the pieces by Elizabeth Reeder and Amanda Thomson, both responding to the recently published study Women of Moray. Thomson’s etching and artist’s book document the self-taught botanist Mary McCallum Webster of Moray, while Reeder’s short story imagines Webster on a forest walk collecting her favourite flower. Karen Campbell and Donna Moore’s suffragette stories offer possible contexts and new meaning for prints by Elspeth Lamb, Claire Barclay and Ashley Cook. Providing a pause between histories and texts, Shauna McMullan’s 165 Stars, Found in GWL Lending Library, a collection of asterisks drawn in the library’s books, gives voice to the library’s users. Amanda Thompson’s handmade book, in response to Women of Moray, entitled Moneses Uniflora, 2012. 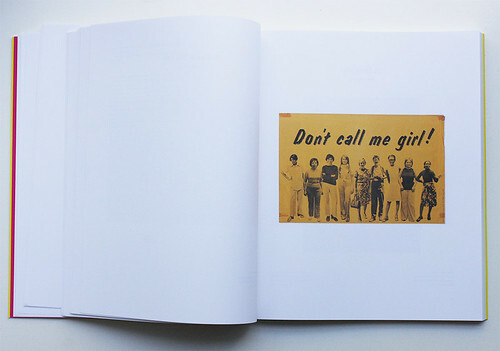 Spread showing Don’t call me girl, Chicago Women’s Graphics Collective, 1974. The contributors include A. L. Kennedy, Muriel Gray, Jackie Kay, Louise Welsh, Sam Ainsley, Lucy Skaer and 2014 Turner Prize nominee Ciara Phillips. The pieces produced are very ‘Scottish’ – humorous and dour; enlightening and profound. The texts, particularly narratives, are accessible in a way some of the art is not. The tragic story of Anne Donovan’s factory worker might bring you to tears; three photographs of Karla Black’s collection of 50 small paper sculptures will not. The travelling exhibition accompanying the book may provide the opportunity to experience the artworks up close, but in several cases the artworks communicate like the scaled-down reproductions they are. The book is big, but for some of the art it can’t ever be big enough. Still, it is easy to read. 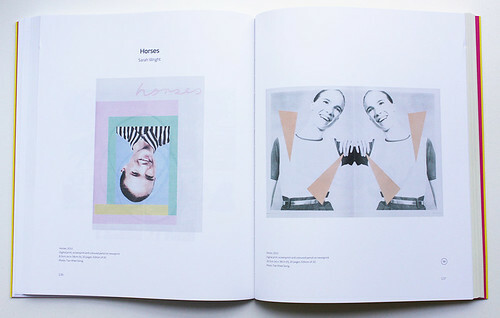 Set in columns, the type is light and modern, and the uncoated paper gives the reproduced artwork a muted quality. Yet the brash magenta and yellow cover art clashes with the content: it shouts out from the shelves ‘Look at me!’ Since there is quite a lot to shout about here, why not? 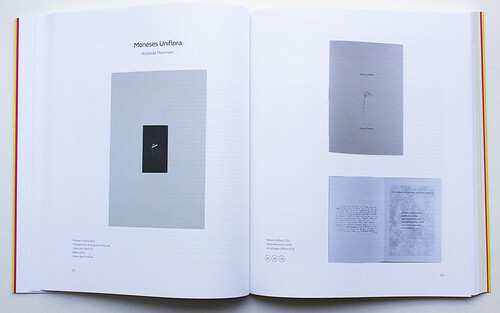 Sarah Wright’s Horses, 2012, took the library’s vast collection of ’zines as inspiration.